MOREHEAD CITY, N.C. — Cookbook author Jean Anderson says her home state lacks the antebellum riches of Virginia and the other Carolina. “They call us ‘the valley of humility between two mountains of conceit,’ ’’ she says. But what Tar Heels lack in grand houses, they make up for with beaches — miles and miles of them — and in this coastal city, with delicious tomato pie. Come summer, thousands of tourists descend upon the southern tip of North Carolina’s Outer Banks, headed for sandy getaways on the islands of Bogue Sound. Once there, they can cross a bridge into Morehead City and hop on a deep-sea charter fishing boat — or find the Friendly Market. Seven days a week, Mindy and Matt Fitzpatrick run the nursery and farm stand, which spills over with berries, melons, veggies, sweet basil from Matt’s quarter-acre garden, and field-grown tomatoes from Bo Quinn’s Newport farm 10 miles away. The thriving produce stand, which sits among strip malls and shopping centers, is a fairly new enterprise. “It was 2008, the economy had tanked, and we had this commercial piece of land my parents left us,’’ says Mindy Fitzpatrick, the baker of the family. On opening day, she put out six tomato pies adapted from her mother’s recipe. “I prayed someone would buy one,’’ she says. That was two years and thousands of pies ago. The duo also make their own bread, asparagus tortes, and strawberry shortcakes. They rise at 4 a.m. to keep up with the demand. Beyond Fitzpatrick’s mother, the origins of this decidedly unpizza-like pie are anyone’s guess. 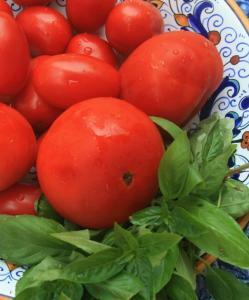 The first Americans to bake savory tomato pies might have been New England Shakers. In “The Best of Shaker Cooking,’’ by Persis Fuller and Amy Bess Miller, a 19th-century tomato pie recipe using cream, bacon, and nutmeg comes from Mary Whitcher, who with her husband, Benjamin, donated land to found the Shaker community of Canterbury, N.H. “We have tomatoes for every meal — fried for breakfast, stewed for dinner, soup for supper,’’ reads a note in the recipe. Old-fashioned cooks who make tomato pies use both ripe red and unripe green fruits. “The classic old North Carolina tomato pie is a dessert pie made with green tomatoes,’’ says Anderson. “My guess is that it was invented by the chefs of Southern plantation kitchens, who were slaves.’’ The recipe in her book “A Love Affair With Southern Cooking’’ dates back more than 100 years. It calls for layering green tomatoes with a streusel-like mixture of brown and granulated sugars, flour, butter, cinnamon, and ginger. Hybrid or heirloom, the best tomatoes to use are the freshest ones you can find — ideally those picked from your own backyard, and never those that come wrapped in plastic. “Some tomatoes will never taste good because they’re bred to be picked green and shipped,’’ says the grower. The Friendly Market, 205 Friendly Road, Morehead City, N.C., 252-808-7954. www.thefriendlymarket.com.